Companies of all sizes use Cloudant to manage data for many types of large or fast-growing web and mobile apps in ecommerce, on-line education, gaming, financial services, networking, and other industries. 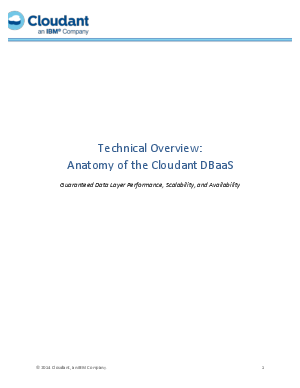 Cloudant is best suited for applications that require an operational data store to handle a massively concurrent mix of low-latency reads and writes. Its data replication & synchronization technology also enables continuous data availability, as well as off-line app usage for mobile or remote users. As a JSON document store, Cloudant is ideal for managing multi- or un-structured data. Advanced indexing makes it easy to enrich applications with location-based (geo-spatial) services, full-text search, and real-time analytics. As explained later in the paper, a Cloudant account can be hosted within a multi-tenant Cloudant cluster, or on a single-tenant cluster running on dedicated hardware hosted within a top-tier cloud provider like Rackspace or IBM SoftLayer.